Fantastic series of Art Deco Bowl lights to match any Art Deco decor. These bowl lights have incredible beauty and flexibility. 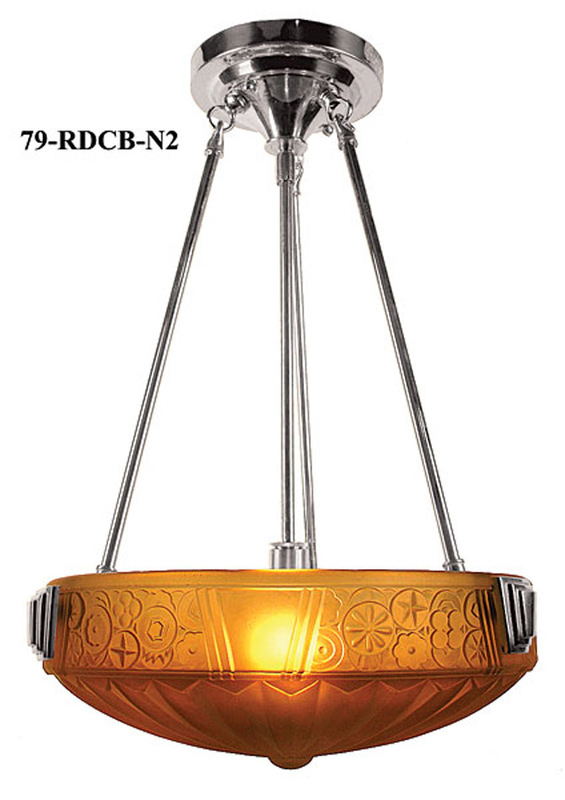 Nice large heavily embossed glass shade at 14" diameter is available in amber, frosted white, or cranberry, and your choice of finish. The shade can be removed easily for cleaning. Each center stem has a cluster of 3 sockets, so 300 watts is easily obtainable. The center stem, holding the sockets is on a swivel, so slightly uneven ceiling mounting can be adjusted. The three sockets can easily use the energy saving screw in CF curly bulbs or our new LED bulbs (pictured below). The fixture can also be made with the top-of-the-line Electronic CF fluorescent fittings for an additional up-charge for ballast and bulb. Measurements: Assembled fixture, without length modifications, is 20" from top of the canopy to the bottom of the shade. Fixture may be shortened to 16" overall. Longer rod lengths for this light can be custom made for your project. Please call (360) 379-9030 for details.